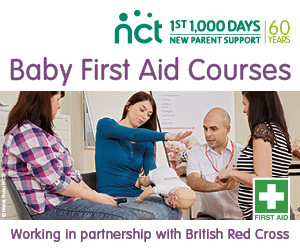 Booking is now open for the next Stockport & District NCT Baby and Toddler First Aid Courses in partnership with the British Red Cross. There will be 2 courses on Saturday 1st April at Cheadle Hulme Methodist Church – choose between the morning session (10am – 12.30pm) and the afternoon session (1.30 – 4pm). Please note the courses on Saturday 4th March are now fully booked. The 2.5 hours course will be delivered by an expert British Red Cross trainer and will cover topics that typically concern parents such as delivering CPR, choking and burns, and Meningitis. Every parent has worries about facing an emergency situation involving their child. These courses will address your fears giving you lots of practice in lifesaving techniques and plenty of opportunity to ask questions.